The Holidays are Coming – Let’s Get Organized! They are coming closer… those days of choosing and hiding and wrapping… those wonderful days of family gatherings and time with friends… warm drinks and tasty treats… Friends, the holidays are coming. 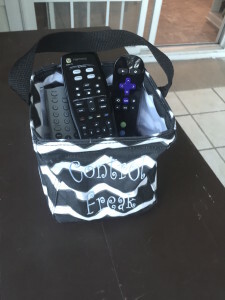 No need to stress or break out in a sweat ~ let me share my tips for organizing yourself and your home so you can meet those wonderful days with function and style and a little Thirty-One Gifts! 1. 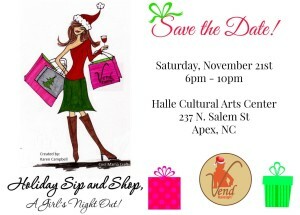 Make Your List… and Check It Twice! Use your smart phone, computer, or paper and pen to do a brain dump of everything you need to do, who you need to buy gifts for, and who you’ll be sending cards to. 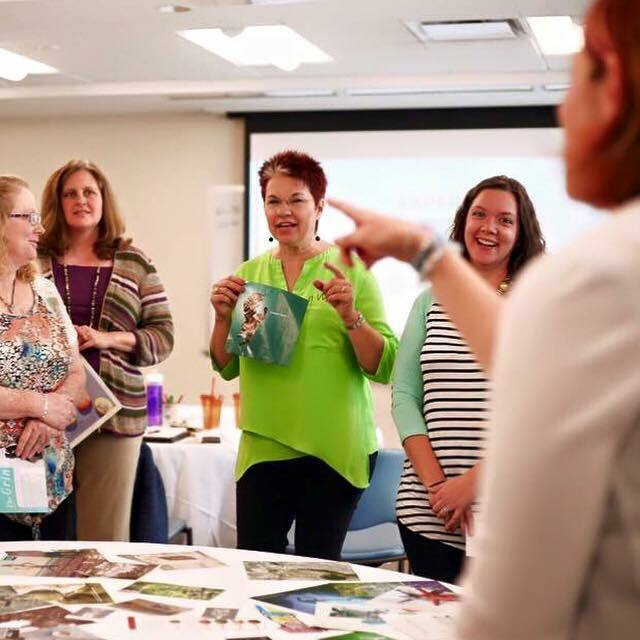 The ‘holiday’ season seems to stretch out from pre-Halloween to post New Years… and that is a lot of time for stress to build and tasks to seem daunting. Lists will give you a feeling of instant control – and the satisfaction from crossing items off can’t be beat! Lists are only as great as your ability to look at them and complete items. Giving yourself deadlines will keep you on track and feeling accomplished. When do you want to send your cards out? By what date would you like your home decorations up? 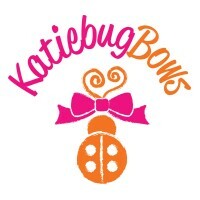 What is your target date for hitting the post office with gifts traveling to relatives and friends who are not local? You decide – and do it! Have you ever gone shopping for strings of white lights only to come home to find that last year you purchased new strings of white lights? This is so me! This year, I’m taking stock of what I have before I hit the stores. To help me stay organized, I write down what we have and what we might need. 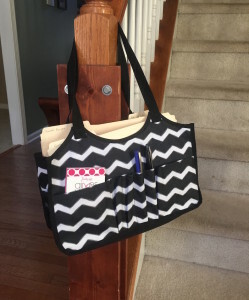 Using a Keep-It Tote is an easy way to keep this information organized. Manila folders stand up perfectly in this tote and the longer straps keep it portable. My folders are labeled with the following: holidays – buy/fix, secret recipes, gift list – current, gift lists – past. As I check out what I have, I also can weed out things that are broken, no longer work, or that we no longer use/need. This is the perfect time to clean out closets, bedrooms, and playrooms and remove clothing that no longer fits and toys that are collecting dust. 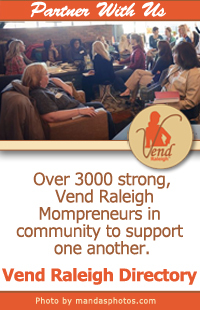 I keep a Large Utility Tote in the closet of each of my three children’s bedrooms and as they outgrow items and the tote fills, I can easily get items to my favorite Raleigh area non-profit: Note in the Pocket. This helps clothing get to children in need and clears out drawer space for the new duds that I know grandparents will be sending. My children each have a Stand Tall Bin for their beloved ‘stuffies’ with the idea being that once the bin is full, we need to remove some stuffed animals if they want to add to it. This momma has either gotten a little lax… or they have been multiplying in the night! Either way, my children have too much ‘stuff’ and some of it needs to go. This helps me help them understand the importance of giving and donating and helping others… qualities that I am ever striving to foster in them. Have you ever noticed that as your holiday decorations go up, your home seems… more cluttered? Take advantage of this and do something about it. Before decorating, walk around your home and remove items that do not have a purpose or that do not bring you joy. I love William Morrison’s Golden Rule: “Have nothing in your houses that you do not know to be useful, or believe to be beautiful.” I use several ‘clutter catchers’ in my home for the areas I know are prone to trouble – each of these is useful, or as I like to say, ‘fun and functional.’ A Littles Carry All embroidered with “Control Freak” is perfect for my husband’s collection of remote controls. The Your Way Rectangle Basket with Liner on my kitchen counter is embroidered with “Clutter!” and holds… clutter! It’s a space designated for the ‘stuff’ that collects there and when it’s full I tackle it. 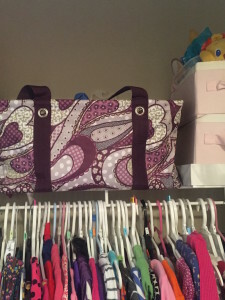 A Soft Utility Tote is always at the bottom or top of my stairs and ready to go. I use this when I’m downstairs to put items in that need to go back up… and vice versa. 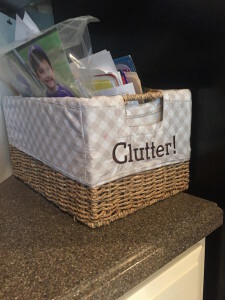 I am a busy momma of three young children and may not win the war on clutter in my home right now – but I can at least contain it. I buy gifts all year round. 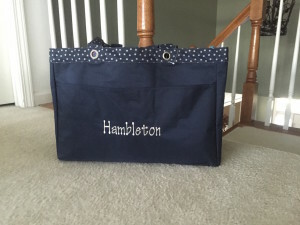 Whenever I see something that I know someone I love would love, I buy it and it goes in a very plain Deluxe Utility Tote up high in my closet (shh… don’t tell my husband!). Very often, as I go through this tote in early December, I will find that I have about 10 items purchased throughout the year for one person on my list… and very little for someone else. To prevent this I have gone back to my tip #1 above: Make a list. If someone offers to bring a side dish or an appetizer, let them. If someone offers to watch the kids while you get some errands done, let them. We all know that the kitchen tends to be a central gathering place in the home… I say put those folks to work if they ask if there is something they can do. Working together creates an atmosphere of joint responsibility, is more fun, and you’re making memories together. I have the perfect apron for my guests to wear when they offer help. 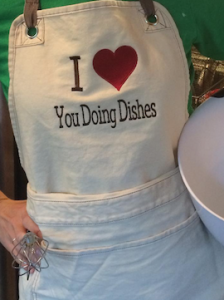 My Gather Together Apron is embroidered with the following: “I love you doing dishes!” Perfect, eh? This can be a daunting task if you’re not organized! I use my Stand Tall Bin to hold my wrapping paper. 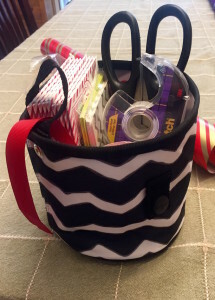 An Oh Snap Bin holds scissors, tape, ribbon and other small supplies. Simple, organized, portable… easy. My goodies get wrapped and go back into the Deluxe Utility Tote in my closet or to the post office for mailing. My joy in giving will not be thwarted through frustration with wrapping! My Double Duty Caddy works overtime through the holidays! 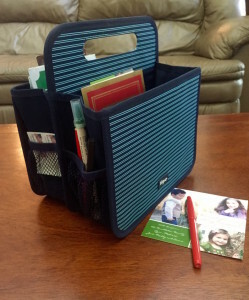 This portable caddy holds my colored pens and stamps in the side mesh pockets. One of the larger divided areas holds my new cards along with my list so that I can check off as I go. As I finish each card, it goes to the other side of the caddy to wait stamping and ultimately reaching my mailbox. 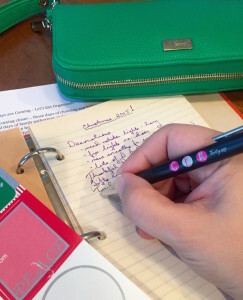 No pens to hunt down or stamps to find… everything is always together and ready so I can write out cards while I’m waiting in the lobby at my kids dance class, at the kitchen table after dinner, or while relaxing on the sofa! If you have any other tips for organizing for the holidays or have questions about the ideas and products shared, I would love to hear them! Feel free to send me an email at [email protected]. Melissa is a busy momma of three young children who strives to keep her home chaos contained.As a Director with Thirty-One Gifts, she enjoys helping others find solutions to organize trouble spots in their homes and lives, as well as her own.Find out more about Melissa through her website (www.mythiryone.com/mhambleton) or her Facebook group: The Bag Lady - Raleigh NC.She is a Vend Raleigh Directory Member.